Felicia strongly believes in the importance of exercise for overall health and well being. Her philosophy is to help clients set and reach their goals and give them the tools they need to maintain that goal. 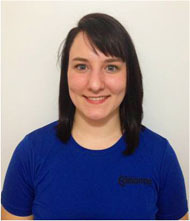 Felicia has worked with young athletes in the sports of gymnastics and cheerleading. She is now taking a shift towards individual fitness and non sports related fitness. Felicia believes that, if you can be realistic, be confident in yourself and work hard at what you want, you can achieve your fitness, nutritional, and lifestyle goals.